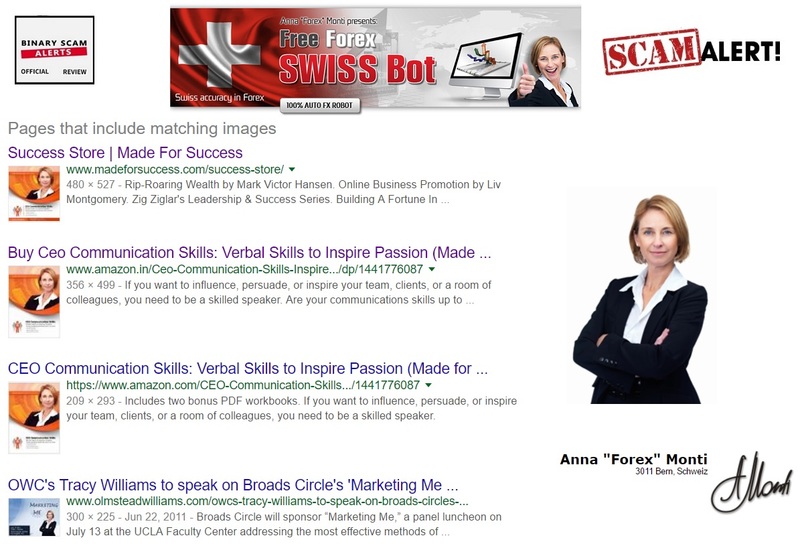 Binary Scam Alerts » Forex Scam Reviews » Swiss Bot by Anna Forex Review, SCAM Swiss Robot Exposed! 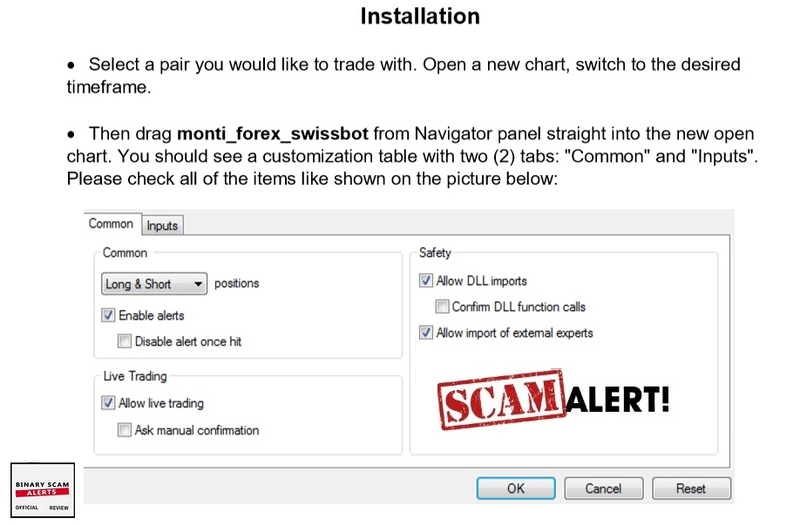 The Swiss Bot Forex automated trading robot by Anna “Forex” Monti is a SCAM, and we BLACKLISTED it in our detailed and factual review and investigation. If you have received a SPAM email communication inviting you to join this fake auto-trader, make sure to refrain from clicking any of the links associated with it, and unsubscribe immediately. We have received some alarming news that a rogue group of unethical affiliate marketers are promoting this phony system and have gone to great lengths in order to cover their tracks. Despite everything, the nature of the complaints we received coupled with our effective research abilities have led us to the unequivocal conclusion that the Swiss Bot by Anna Monti is a confirmed financial SCAM and should not be trusted. If for some reason you believe this app is legit or genuine, then you had better get ready to have your wallet fleeced by shady and unlicensed offshore brokers operating from suspicious jurisdictions such as Vanuatu or Seychelles. Keep reading to see the proof and evidence our staff was able to produce and why we believe this app will steal your money. Below is a screenshot of “Anna Forex Monti”, located on 3011 Bern Schweiz. In reality this is a fictitious character and the picture is either purchased from an image bank or most likely stolen from the internet and used without permission. Additionally, below you can see the software says it “performs with a bullet-proof reliability of a Swiss Bank.” This is not only a blatant lie, but also contradictory in tone since they previously state in their own sales page that no system is able to provide guaranteed returns. Furthermore, there are severe grammatical errors as they say “Forex doesn’t always takes money, it can also make them”. That’s not even close to proper English, and strongly suggests that we are dealing with a nasty bunch of foreign criminals. Here’s the final nail in the coffin. Miss Anna “Forex” Monti has provided “Read Feedback” on her YouTube Channel. Unfortunately this is a lie, and the person who is using the alias “Gregory Rice” is a cheap Fiverr.com actor who will sell his left kidney if the price is right. Forex SwissBOT is promoted by the merchant as a “unique Forex instrument, developed and based on the expertise of highly knowledgeable and leading traders in this field.” Designed while keeping in mind traditional Swiss Watchmaker traditions, it is portrayed as a trading robot which produces consistent profits regardless if you are an experienced or novice trader. To use this robot you must download an MT4 trading terminal and install the software by selecting the “common criteria” in the allotted tabs. For example, you need to enable alerts, allow long and short positions, live trading, All DLL Imports, as well as importing external experts. What does this mean? Well, in short it is not as simple as they would like you to think. For example, a DLL is an application which stores the signals that are derived from the MT4 terminal, but if you are just starting out there is no way for you to know this. Additionally, there is a GANN2-1 Indicator setup which is optional. To activate you you would need to enter your trading dashboard and install this software again. Gann Indications are used to inform traders about trend directions, but if you are just starting out just leave it and move on it’s not critical. To select lower time frames, you can use it at EUR/USD only, on M30 and M15. If you prefer, you can simultaneously add both EUR/USD time-frames. In this case you would need to change “Magic number” while executing this task. If all of this is starting to sound too complicated then you are correct. A Magic Number is a tool expert advisers used when they have conflicting signals provided on varying time-frames. Again, this is not something a beginner would know and even more advanced traders would have a difficult time utilizing and processing this type of information. 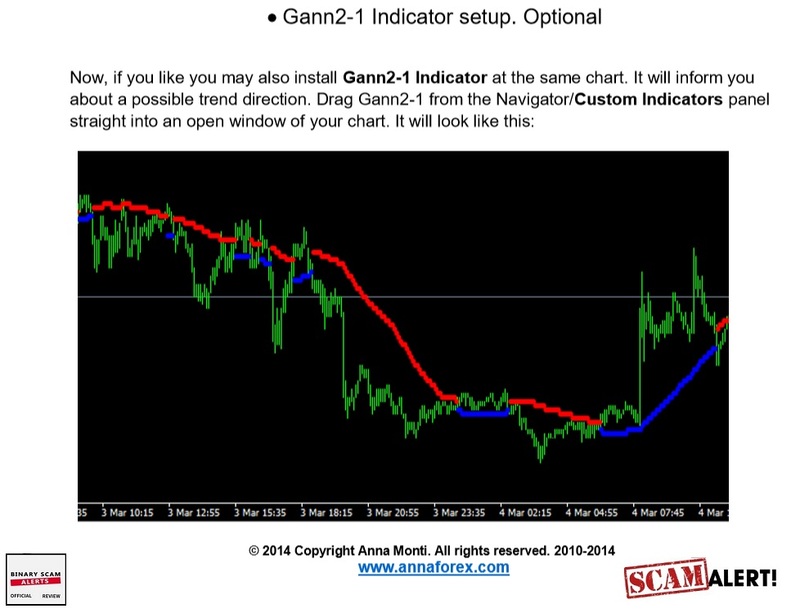 The Swiss Bot by Anna “Forex” Monti is a smart scam which failed at the very basics. You can see that it’s been live since 2014 and no one really exposed it until now. 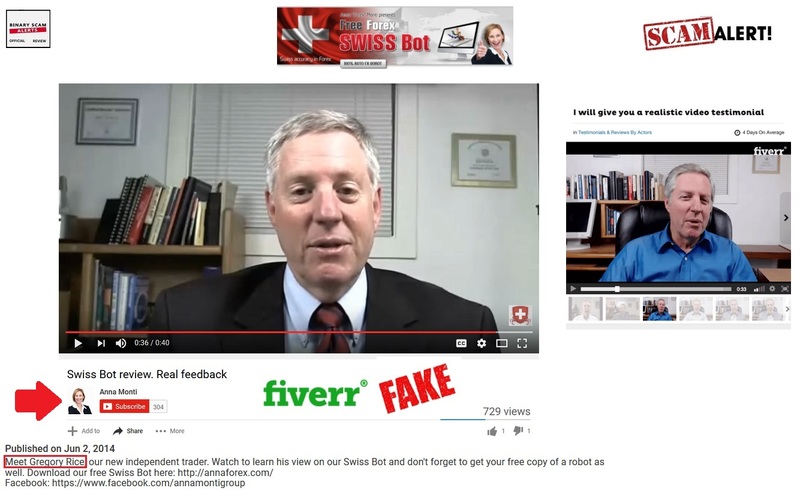 The most obvious scam tactic is the use of fake testimonials, and it is very evident and a recurring motif which keeps resurfacing on YouTube as well as on the sales page itself. In reality, it is NOT designed for new traders, and traders looking for a smarter solution will surely use alternative systems such as Vladimir Ribakov’s sRs Trend Rider 2.0. No, you will need to fund a trading account with one of their recommended brokers and that is where they SCAM you. Once you start you will end up confused and frustrated as this system is fraudulent and the brokers associated with it care nothing about your financial welfare and only want to see you invest more. The hot scams trending now are Quantum Code and 30 Day 30K Challenge. If you are looking for a good Expert Adviser or alternatively a tested Forex robot and not sure about how to proceed you are not alone. We have scrounged the internet looking for the best and most consistent money making machines. These are all showcased in our recommended systems section. 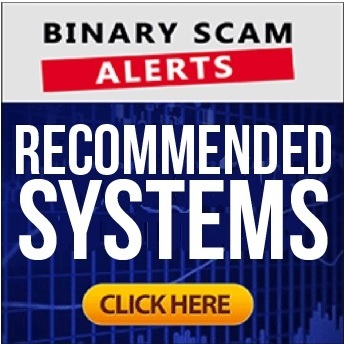 The Swiss Forex Bot software by Anna Monti is a BLACKLISTED Scam and we have proven this in our detailed and factual review and investigation. If you have fallen victim to this old and extremely effective Forex scam and deposited money with a shady offshore broker, then we advise you to refrain from re-investing. Furthermore, never agree to sign any type of documentation or agree to accept any form of compensation or bonus cash as these carry a trading requirement and as a result you will never be able to withdraw your money. We know that you are looking for a legit and genuine trading app, however Anna Forex is NOT it, so please make sure to avoid it. In light of all the evidence our staff was able to produce, we are forced yet again to blacklist this offer and recommend our members and subscribers seek alternative investment avenues. Don’t forget to join our Facebook Page and YouTube channel for additional updates.